If you’re looking for something to keep your youngsters entertained on Monday (July 10), Waterstones in Oban has just the thing. 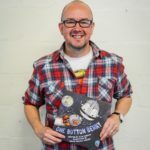 Come and meet Oban-based children’s author Alan Windram who will be reading his fantastic new robot picture book, One Button Benny. After listening to the story, join in with the specially-written singalong songs, robot dancing and there might even be some robot karaoke. The free event, which is for three to seven-year-olds, starts at 3pm on Monday July 10 in Waterstone’s, 12 George Street, Oban. Following the event, Alan will be signing books in the shop.